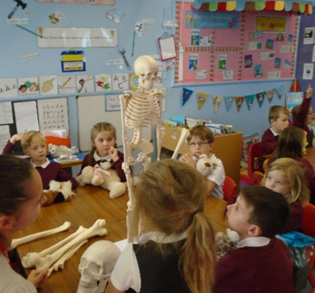 The children in Y1 Hazel and Holly classes were very excited to receive a visit from medical students from the Peninsula Medical School. They learnt how to wash their hands thoroughly so they had no nasty germs, how to test their pulse rate and see the effects of exercise on their bodies. It was very exciting to learn about the skeleton and the important job it does for our bodies and how to measure how much air goes in and out of our lungs. Our teddies were treated too and we listened to their hearts and gave them a plaster or bandage if they were hurt. Some teddies had their own ‘pawscription’ too!